One Year Anniversary of Ruby Tuesday! You all should be proud how successful you've made this meme! I promised last week that I would give PRIZEs to 3 people who make a comment today (I can't count on Mr. Linky but please sign if it's there) and post a Ruby Tuesday post. I will post the winners late Wednesday May 27. I'll notify each winner on their own blog. The winners should then send me their snail mail address (home address) and I'll send them their prize. Thank you all so much for making this past year so enjoyable! I love going around to Ruby Tuesday players (I know I don't always get to everyone; I wish I could). Ruby Tuesday comments are now closed. Happy anniversary Mary, I'm delighted to be a part of what you've created here. Congratulations, Mary, on a whole year of Ruby Tuesday fun! This is truly a happy occasion! 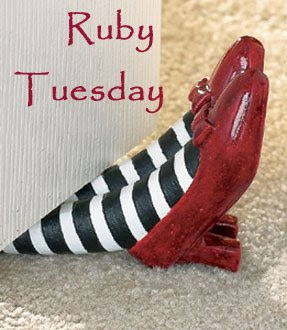 I so often try to think of what makes a Ruby Tuesday...all the time!. Reds are all around us, and this meme is what makes me see red just about everywhere! Happy aniversary Mary creator of my favorite memes. May RT continue for many more years! Happy birthday Ruby Tuesday! I've sure enjoyed myself this year. Thanks for your delightful hosting, Mary. Pleasure's mine, I enjoyed hunting food with red on it! I did mostly fruits but my faves would be those related to baking! Congratulations! Lets enjoy more years to come! This being a holiday I almost forgot it was Monday. Never mind an anniversary! It's been a fun year (or part of a year for me). Can't wait to see what happens next. Wow, this is neat! Having a continuing reality post grow so fast and have so many paricipants is special! Happy First Anniversary. It is a fun post for us to make and read, seems there are always RED items waiting to get snapped and viewed. Thank you too for having the contest. If the First Prize Winner doesn't like the NYC book, I have one I would trade. It is a pictorial of NYC, all photos taken by air. Happy Anniversary to Ruby Tuesday. The prizes in the first group are amusing. Does "New York the Wonder City" have something inside? 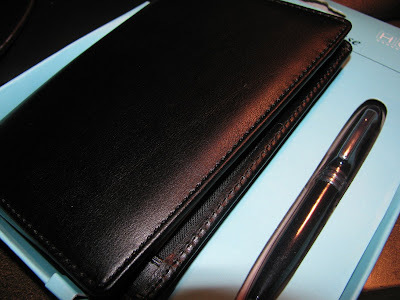 Or is it a blank journal? Happy Anniversary, Mary. Thank you for creating this fun meme. Red and Tuesday will never be the same again for those who participate. Love how we get such international and varied posts. Happy anniversary to you and many thanks for letting me be a part of the 'red'! hard to believe a year has gone by already! Happy anniversary Mary! I always enjoy finding things to post for my Ruby Tuesdays, and you inspired me to create my own photo meme. Happy birthday to teach Mary and to Ruby Tuesday. Being allowed to participate in Ruby Tuesday has been a joy and an inspiration. Hope you will continue hosting this meme for a long, long time. This is a great theme that you started and one that I love to participate in. Happy Ruby Anniversary Tuesday! Congrats to ur 1st anniversary for RT and also to the 3 lucky winners (will i be one of them? :D ). Happy 1st Anniversary to RT!!! Oh Mary, Congratulations on a wonderful year. I have enjoyed this meme so much, and met so many super folks along the way. Gee Mary is it just me or did that year just fly by. Cool piece of art! Happy Anniversary, Ruby Tuesday! Happy anniversary, Mary. 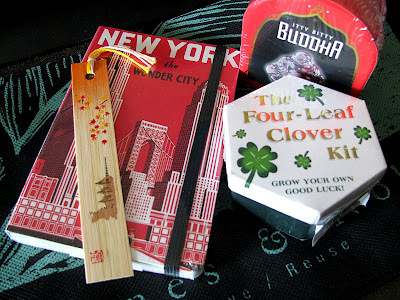 And oh look at that little Buddha kit. I got one of those for my house a while back. It's a fun little kit. Many thanks Mary for keeping this meme going. I've had so much fun finding all the red on my train layout. Congrats on 1 year. Congrats on the anniversary! Great blog and great job running it even with Mr. Linky giving problems. I did not know this existen before a couple of months ago. Mary, Thanks for hosting this experiment in collective consciousness and community vision. What a great place to meet others with a whimsical bent and a passion for photography! Congratulations, Gurrrl, on your first anniversary! Happy 1 year anniversary to both Mary and all participants :) I agree with the others that Ruby Tuesday is a fun thing, as it continuously makes me notice everything rubyish! Congratulations on your exciting blogoversary! Your idea has borne much fruit. Red fruit, of course! This meme has made an excellent and meaningful contribution to the creativity of many, many people. I hope you are proud of yourself and give yourself a well-deserved pat on the back. Make someone you love give you a big hug for me! I came to wish a Happy Birthday to Ruby Tuesday! And many happy more! Congratulations Mary! I only joined recently but it's been really fun. Happy Anniversary! One year congratulation to you - good work of you. I just found it recently and I have enjoy it so far - it is good to know that always on Tuesdays it is something red. Ralph wrote... " makes me see red..". In sweden to see red - means that you are angry does it mean that in English also? Have fun and hope to see you next week. Congratulations! You have brought joy to my life. Hooray!! Does this mean I have an excuse to eat birthday cake with extra frosting? Congratulations on a most successful meme, Mary! I have followed this meme regularly for most of your year and have enjoyed participating! Happy anniversary! and may this meme run for a long time. :) Am posting my first Ruby Tuesday today. Happy Anniversary Mary!! How quickly time flies, one year already!! And I still love playing, I have hardly missed a week since we started, looking for Ruby Tuesday pictures has become a weekly habbit!! Happy Anniversary! I haven't participated for very long, but I look forward to Tuesday now, because of you! Thank you for your work in keeping up this meme. Thank you for hosting this ever inspiring theme that connects so many nice people and congrats !!!! I am glad I found your Meme. It has made me think about the photos I take. Even looking into a new camera. I use to work for Eastman Kodak and really liked taking photo. My child home had a Developing Room in the basement,Dad taught us how to use it. Some time in the 90's I lost the desire to really take pictures. Now I have acquired it back! Happy 1 year Anniversary Mary. May there be many more!! I'm in for the week! Now back to the business of packing up my life! Happy 1st anniversary of Ruby Tuesday. Red has long been my favorite color, so it is easy to come up with photos to share! Happy Anniversary! Miss participating on this fabulous meme. Thank you Mary for inspiration and challenge. I'll never look at the color red quite the same way again! 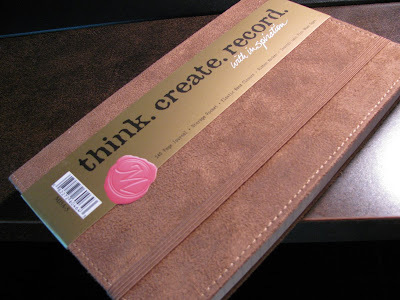 I love the notion of Ruby Tuesday and would love to be one of this week's winners! Congrats on the milestone! Happy anniversary Mary and congratulations! LOL! THAT was creative thinking for your anniversary Ruby! This is a great meme Mary! Thank you so much for hosting it! Mary, thanks you for the opportunity to show my photos. I wouldn't get to see or be seen so much without your venue. Happy anniversary! Congrats! Found your meme through Marie Reed's blog. Congratulations and more power to your blog and RT meme! Great giveaway! I missed Blue Monday, so I hope to get a chance to post my Memorial day photos for Ruby Tuesday instead. Congratulations and happy anniversary, Mary! I enjoy your meme and enjoy looking at the photographs from around the world. Happy Ruby Tuesday to you, and everyone who participates. Congrats on the anniversary of Ruby Tuesday, Mary! I know I haven't participated every single week, but I know I've been around since the beginning! Today, I went for something totally different (I was playing with some of the extra photo-enhancing effects on Picnik via Flickr) and came up with an image that turned one geranium blossom into a psychedelic groovilicious pic. At least I think so! Cheere & Congrats on the Meme-aversary! It takes a lot of work to host a photo theme congrats on the anniversary! Happy Anniversary to Ruby Tuesday .. how wonderful ... and congrats to Mary who makes this blog (and Ruby Tuesday) so popular! Happy Ruby Tuesday Anniversary!!! I love doing this meme. I am always looking for something red to shoot! Thanks for hosting this meme. It's wonderful! Mine is posted at my place. Happy Anniversary to Ruby Tuesday. I'm late getting going with my post and not too thrilled with it, but couldn't let the anniversary go past without participating. I hope Mr. Linky recovers from his illness. Fortunately one of the few bits of html I remember is how to post a link so... here's mine. Thank you Mary for this meme. I really enjoy being a part of this group. The people who post are fantastic. So proud to be a part of this fun meme. My RT post is Little RED Riding Hood. Happy Birthday, RT! Thanks, Mary, for letting me look at reds a whole new way! This is my second time playing and it's a Blast. You really look at the world in a new way. Thanks so much and Happy Anniversary! I played along, here is my link. I'm a bit late posting my Ruby Tuesday picture. I've been out of town. Hop over and enjoy my Stirling Castle Red Roses. Mr. Linky does not seem to be working. Here is my contribution. Happy anniversary for Ruby Tuesday!! I have posted some Ruby Red pics for you!! Hi Mary. I just published mine. You should see it. :) Happy RT and congratulation once again! Happy Ruby Tuesday anniversary. And thanks for the chance to participate in your generous fun give-away. p.s. I love the Ruby Tuesday name, it couldn't be better. I can't find Mr. Linky to post my Ruby Tuesday photo. It may be just my computer, is anyone else having a problem? Since Mr. Linky is on vacation, here's my link. I love Ruby Tuesday! Congratulations on a year of "red".. I am late with mine but I still wanted to visit the others... there are always so many beautiful reds around. My red is here. Congrats on the anniversary, and thanks for hosting this meme! It's been a lot of fun, looking for red things and sharing with all these wonderful folks. dear mary t...thank you for your dedication to ruby tuesday. i hope that you will continue in the next year. it is one day of the week that i really look forward to. i hope that you look at what i posted. i was so surprised the doors that opened when i went into google images...just so incredible! Congratulations on the one year anniversary of your meme! Does that make it a Meme-iversary? Happy Belated Anniversary! This is a wonderful meme, Mary. I love it. This is all kinds of fun! My very first post among all you wonderful bloggers!